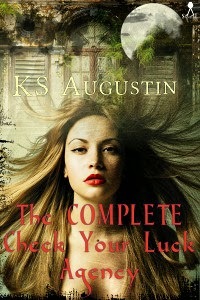 In the past couple of years I've sampled several different urban fantasy series, and the one that stood out for me - capturing my interest and keeping me reading - was the Check Your Luck Agency series. 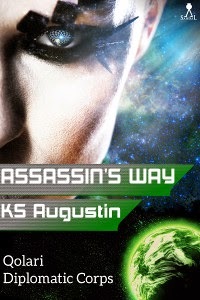 Discovering a wealth of further titles by the same author (I'm dipping into the Qolari Diplomatic Corps series next), I thought I'd try my hand at amateur interviewer and see how self-publishing and science fiction are treating Malaysian-resident KS (Kaz) Augustin (aka Cara d'Bastian). 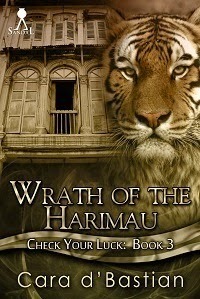 Q. I first came across your books with the urban fantasy Check Your Luck Agency series (set in Malaysia and Singapore and published as Cara d'Bastian). One of the things I really enjoyed was not only discovering a wealth of mythology, but also a resident's-eye view of two countries that rarely seem to feature in genre novels – I've read more SF set on the moon than the majority of countries on Earth. How do you feel about self-publishing opening up genre settings and stories? A. Well, firstly, thanks for inviting me here, Andrea. :) Put plainly, the Check Your Luck series would never have seen the light of day if it weren't for self-publishing. Traditional publishing still seems very parochial to me, rehashing the same ideas in the same settings over and over again. (You see it in North American movies too. Take just the SF genre. Oh goody, we have (a) a weatherboard house, (b) a corn field, (c) strange lights hovering over a rural landscape, (d) two people looking skyward at some point, hand-holding optional. You saw it in Star Trek, Superman, Signs, Dave and a heap of others. Even the latest, Interstellar, has it. Can I say that corn fields have officially jumped the shark? Anyway, getting back to self-publishing. :) Because so many traditional mega-enterprises in the entertainment industries play it safe and rehash the same imagery, anything that's even slightly different doesn't seem to get a look-in. And, when it does, it gets treated shabbily; e.g. Cindy Pon and Barry Hughart with their Chinese-setting fantasies. Being a career writer is hard enough, imo, without bearing additional difficulties from bean-counters and marketeers. I swear, if it wasn't for self-publishing, I'd be clinically insane by now! For other writers, self-pubbing means they can take a chance, be daring and it's my feeling the diversity can only benefit readers (and I include myself in that group). Q. Your work ranges from space opera, urban fantasy, contemporary stories set in south-east Asia, and SF romance. Is there one sub-genre that's particularly close to your heart? A. Oh it's space opera. I adore space opera. It's big and dramatic and beautiful and awe-inspiring, all set against an even bigger, more dramatic and more beautiful universe. 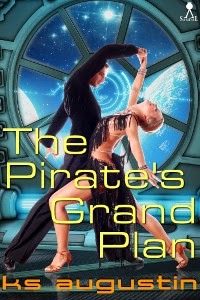 I'm a huge fan of opera, so it's no surprise that space opera really hits my buttons--the characters, the settings, the moral dilemmas, the pits of despair, the heights of exultation. What's there not to like? Q. Last year you launched the Sci-Fi Romance Quarterly Magazine. Do you find it a challenge to juggle the slush pile with your own writing? What's your favourite aspect of taking on this new challenge? A. Luckily (or through cunning planning), there are three of us working on this venture. Heather Massey handles the columnists and the new releases; Diane Dooley is in charge of the slush, although it does briefly pass through my hands on the way to her, and I'm the technical-wallah, basically. We put SFRQ together in an effort to highlight the sub-genre and get a community going. My favourite part of it is the building. As long as I'm "building" something within the parameters of the magazine, I'm happy. Take Issue 3. As part of a cross-fertilisation effort, Ian Sales' "SF Mistressworks" site has partnered with us. SF Mistressworks is a wonderful initiative, bringing prominence to speculative fiction written by women before 2000. There's a lot more around that one would think and SFRQ now has the opportunity to showcase that. Q. 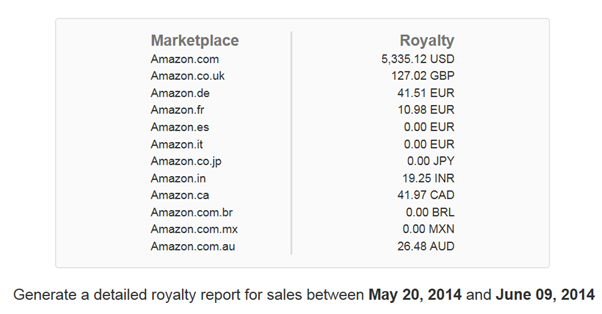 One thing many people don't know is that Amazon displays different books (and prices) to different countries. In some countries they charge a 'Whispernet' surcharge, and in others they won't sell books at all. I've heard you mention that as a self-publisher using Amazon's KDP, you cannot actually see your own books on Amazon. How frustrating! Are there other regional challenges that you've faced as a self-publisher? A. Yes. That was the case back in 2011 when I started Sandal Press and it's still the case now. I can only get to my books "sideways" via the KDP dashboard or Amazon Australia/UK. I'm IP-blocked from accessing information on my books at Amazon US. They won't even display! As far as a south-east Asian reader is concerned, I don't even exist on Amazon, which is sad. 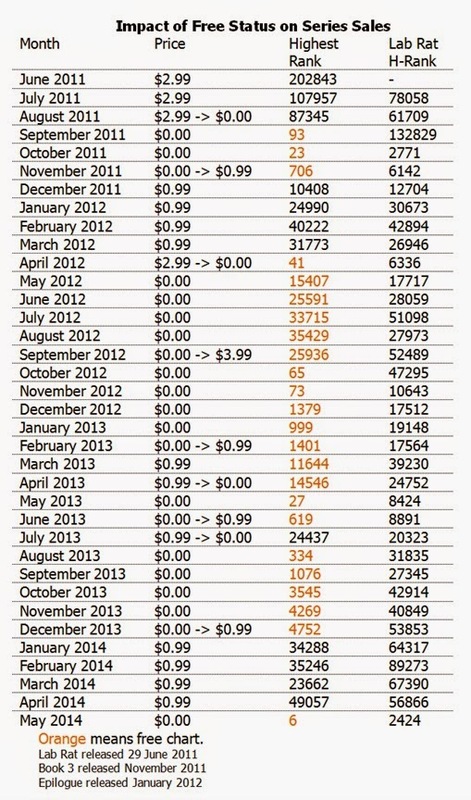 A lot of people get sidelined by the "Kindle available in more than 150 countries!" statement, without thinking what countries they are. Let's be honest here: does an author really believe she's going to sell more of her English-language books in Cambodia (inside Amazon ecosystem; approx. 1.5M English speakers; nominal GDP US$1,015 per capita) as opposed to Singapore/Malaysia (outside Amazon ecosystem; >10M English speakers; nominal GDP US$51,700 / US$10,400). You see, a single number, without context, is useless. So, yes, I was initially very frustrated with not being able to promote my books to the local market. That has since changed, and why that is has to do with the next question! Q. How are ebooks taking off in the Singapore/Malaysia region? Are there local platforms springing up, or is the main focus the big multi-nationals? A. Ebook readers are very expensive here, even with the GDP numbers I've given above (Wikipedia, so take them with a grain of salt, but they're still in the ballpark). I bought my husband and I Kobo ereaders and had to get them shipped from Hong Kong! They're just not available locally. There's a site called "Kindle Malaysia" that recently started selling Kindles (and ways to get around the IP blocking), but the prices are unbelievable. A Kindle Paperwhite that retails for $119 at Amazon US retails for RM740 (with a RM10 case). This equates to US$230, or almost double the price! The local etailer is e-Sentral.com but, with basic ereaders so inaccessible/expensive, I can't see them making any kind of dent in the market. From what I read in the papers, most people prefer playing "Candy Crush"! In addition, I have spent the last year speaking with publishers and distributors across the two countries and, to put it bluntly, I don't write the kind of books that readers want to read. I've been told repeatedly that the Check Your Luck omnibus is too long. People are too busy to read such big books! As for SF, the average reader doesn't even know what speculative fiction is. (Of course there are exceptions, but I'm talking about general trends here.) And the bestsellers break down into either short (<200pp) books full of ghost/"real story" vignettes or get-rich and cookery non-fiction. There is also very much a "nostalgia" element to all this. Readers appear to prefer looking back ("the good ole days", "the trials of WWII occupation", "kampung (village) life") rather than looking forward. Self-publishing is a viable option, and there are a lot of small regional presses throughout south-east Asia, but the books only seem to do well within the parameters I've stated. Oh, and school workbooks. I've been told they are major revenue streams for most local presses. Q. What's the best thing you've encountered in the new self-publishing paradigm? What's the most difficult to deal with? A. The best thing is the control. Everything is down to me (and now my husband J, who has also joined Sandal Press in an administrative capacity), and I like that. I was able to vet, and pick, my own editors, get the covers I want, change them when I want, and set my own pricing. Being a Type-A person, this is heaven to me! The most difficult is getting exposure. When J and I sat down to plan and create Sandal Press, I told him bluntly that this wasn't going to be an instant-riches scenario. I was figuring a ten-year horizon before we would begin to build up enough of a reputation to make money to live off. He was, and is, fine with that, but I find I'm the one who's being impatient. I've got to constantly tell myself to keep it steady, keep writing, read more, stay informed and keep writing. Sandal Press will be three years old in August, so I have seven years to go! I'm gritting my teeth. As you've probably guessed, I'm not a naturally patient person. A. My biggest enemy is time. Besides the SFRQ magazine, I also homeschool our two teenage children, so that really eats into my writing--not that I'd have it any other way, I hasten to add. I think homeschooling is a wonderful way to build solid relationships with your children while learning together at a faster pace than a normal school can provide. Our 12yo daughter, for example, taught herself the Alice scripting language on her own time and J is teaching both kids how to program in C on Linux. They haven't been told it's "difficult" or "too advanced" or that my daughter will run into problems "because she's a girl", so they're just getting down and doing it! I think that's wonderful. But back to your question. :) In no particular order, I need to finish my Perdition galactic empire space opera series (three books down, three to go), continue my Qolari Diplomatic Corps series (assassin space opera) and I'm currently working on a book that's outside my usual Republic and Fusion universes. I have a fantasy series I'm eager to start within the next two to three years, maybe some more Check Your Luck books (eh, Andrea? 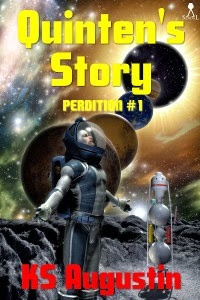 ), and a near-future SF thriller series that keeps kicking around in my head. In the immediate future, Quinten's Choice (Perdition #3) should be out in July; Guarding His Body (a contemporary romance reissue) is slated for September; Project Restoration (an SFR short novel) should also be out in September/October; The Siege of Olim (Qolari Diplomatic Corps #2) should be released around November/December; and Quinten's Gamble (Perdition #4) is pencilled in for early next year. That's the plan, anyway. We'll see whether I can stick to it. -The Sandal Press home page, blog and Twitter. 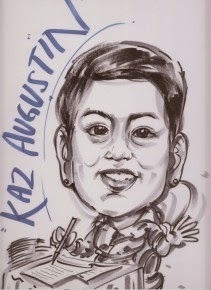 -Kaz's personal site and blog. My approach to self-publishing involves very little promotion. I did submit my books to a small handful of book bloggers way back when I was starting out (and was very fortunate that one of them was The Book Smugglers!). Along with the enormously generous support I've received from other writers, book blogger reviews have definitely made readers more inclined to pick up my books. Make one free (particularly first-in-series). Get buoyed along by 'also boughts' and bestseller lists. Rinse/repeat, along with judicious use of that year's Holy Grail (currently Bookbub). 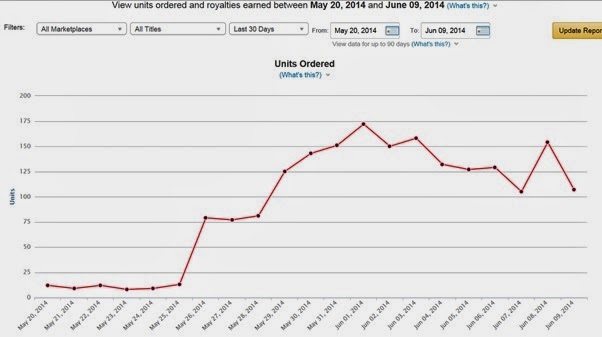 For those interested in the behind-the-scenes of this process, I've been grabbing charts and stats to show the impact of free on the sales of my books. To start off with, here's a long chart of Book 1 and Book 2 of The Touchstone Trilogy, where you can see the impact to my sales over several years. 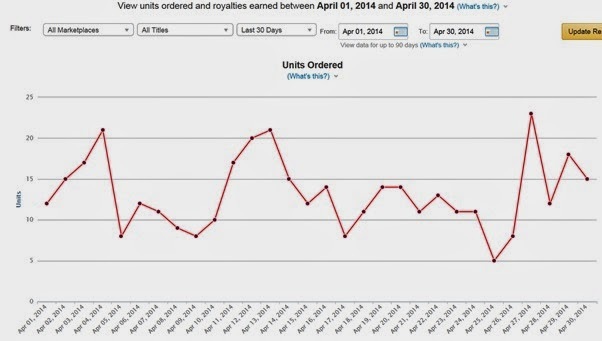 To give you some idea of how much money is involved in these rankings, first here's my sales for April 2014 (for all books in all Amazon markets) during a period when I had no freebies running. 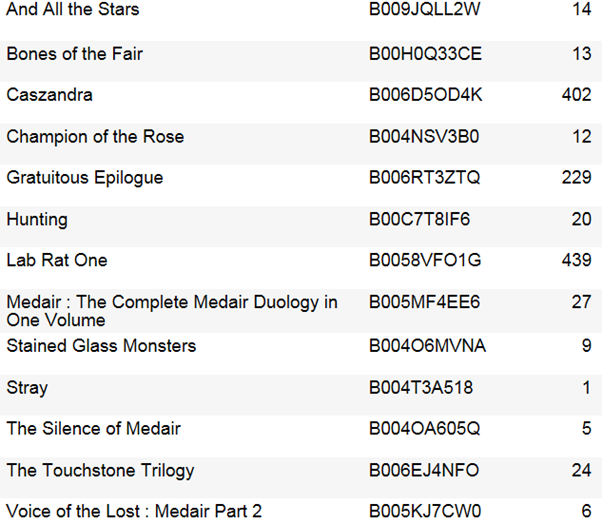 And here are my sales for the fortnight or so following the 'Holy Grail' I mentioned earlier - a Bookbub promotion on the back of a free first book in a series. Sadly, it's rare that price juicing has a permanent impact, but free is definitely a way to get your book out there and it's a hell of a rush to earn the equivalent of a book advance in a fortnight. I gave away around 30,000 free copies of Stray this time (only a tiny fraction of those will ever be read), and will probably simply leave the book on permafree from now on. And as the years go by, I slowly increase the numbers of 'my' readers out there - people who look specifically for my books and buy them when they're put out. Not because of any price juicing or random encounter in the also-boughts list. The career of a self-publisher can follow a very different path to trade authors (where pre-promotion and first week sales are so important). Mine has been a slow build thing, but fun and interesting and a viable second income. And most certainly not an endless grind of promotion. A noir-style mystery set in Salem, where you set out to solve your own murder and stop a serial killer. Reasonable, not brilliant, with some suitably spooky touches, especially with the ghosty people that flicker out of existence if you try to get closer to look at them. Extremely lazy execution, with the same few models used over and over and over again for the people. Salem Police Force is apparently all-male, and for a while there I thought Salem was an all-white environment as well, but a handful of POC showed up about halfway through the game. Play-style wise, collecting clues and picking the most relevant ones to solve your mystery of the moment is reasonably entertaining, if very forgiving. Walking through (some) walls is amusing, and possessing people and reading their thoughts fun enough the first few times. But it never really built to something compelling, and was remarkable for the number of people who have the exact same thought when you possess them. It's a very half-assed game, taking you through the main story with a few minor sidequests, with very little option for variation. It's also very short. Very very short. Fedora-wearing ex-con cop is murdered by masked serial killer, runs around as a ghost trying to solve own murder. His wife redeems him and is fridged in the first flashback. Most of the people he helps as a ghost are young girls and women apparently incapable of keeping it together as well as ex-con cop ghosts. I won't spoil the story, other than to note that I give the identity of the killer extreme side-eye given the historical rather than fictional story, and rather wonder why all mediums are women (almost all of them young). Anyways, it's light entertainment, not very well executed, tolerable if you feel the need for more drawling tough-guy in your gaming life, and absolutely not worth the premium game price it's being sold at.